There are two flavors that mean Christmas to me: eggnog and peppermint. 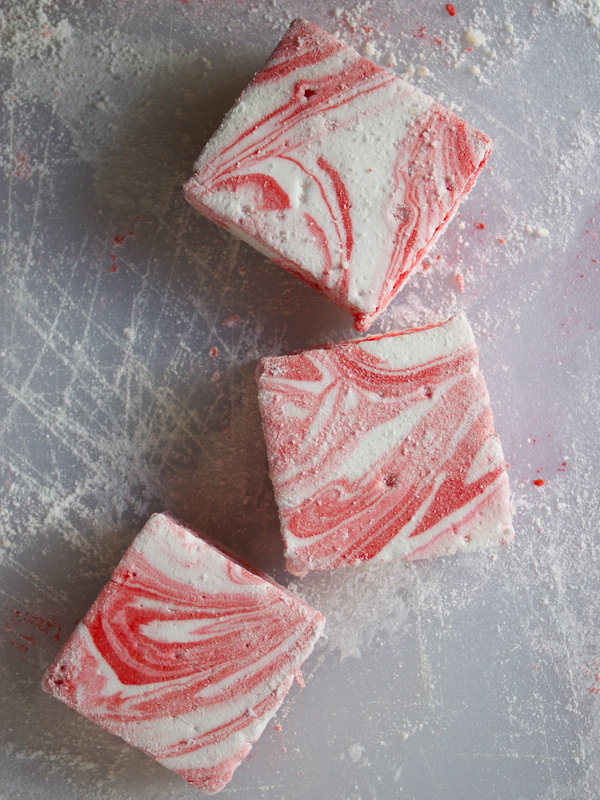 So, peppermint marshmallows were kind of a must this month. I’ve put the base recipe in this post—perfect for popping on their own, or floating in hot chocolate—then I’ve also created a recipe for some chocolate-covered versions that are crazy good. A little too popable. In a medium saucepan on medium heat, combine the sugar and 1/2 of a cup of water (or sugar and corn syrup), then stir until sugar has dissolved—about 3 to 5 minutes. Increase heat to bring mixture to a low boil, and continue to boil until the temperature reaches 240 degrees F on a candy thermometer—about 12 to 15 minutes. Remove from heat. Slowly pour sugar mixture into the bowl with the gelatin, simultaneously using a mixer on low. 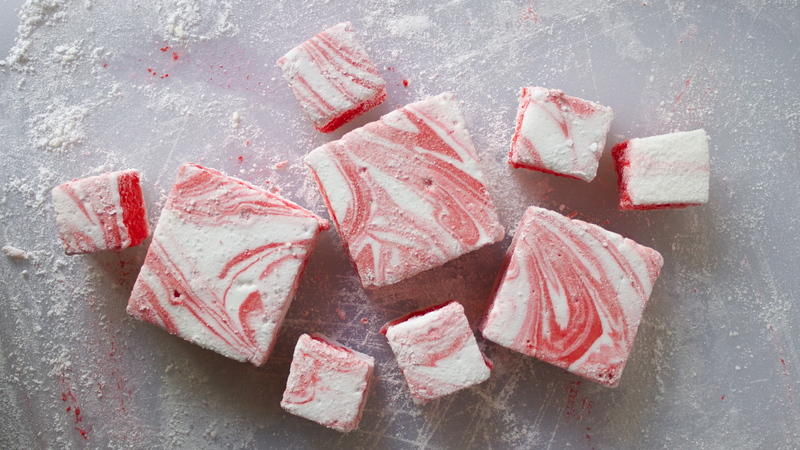 Gradually increase speed to high and continue whipping until the mix is very thick, about 10 to 15 minutes—imagine the consistency of pourable taffy. (A standing mixer on high may do this in more like 10 minutes, so keep an eye on it.) Add peppermint at the end and mix for about 30 seconds more. Coat tinfoil in the jellyroll pan with cooking spray. Pour all but about 1 cup of the marshmallow batter into the pan. 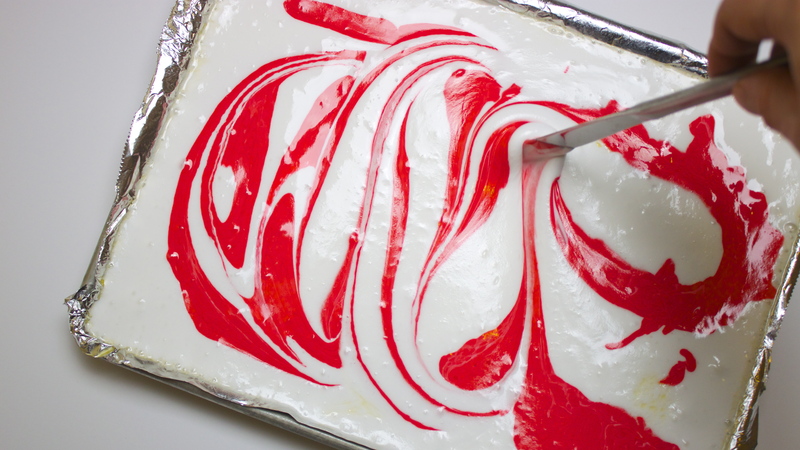 Add drops of red food coloring to the remaining cup of batter and stir until you get the shade of red you want. 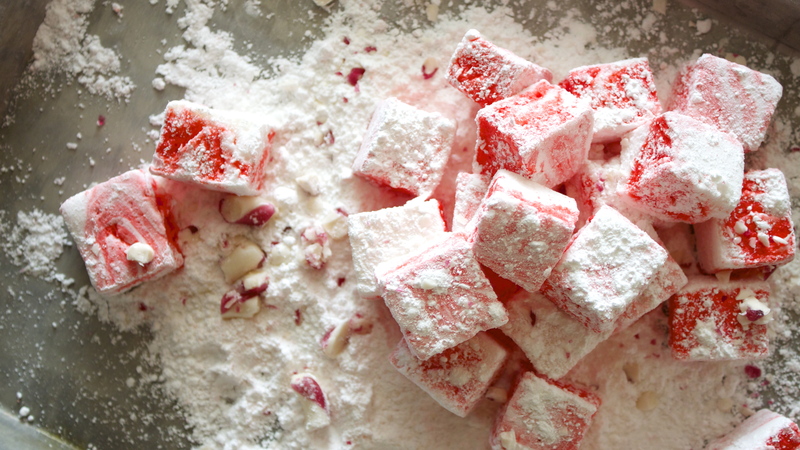 Pour red marshmallow on top of white marshmallow in an “S” shape or in large polka-dot-like dollops. 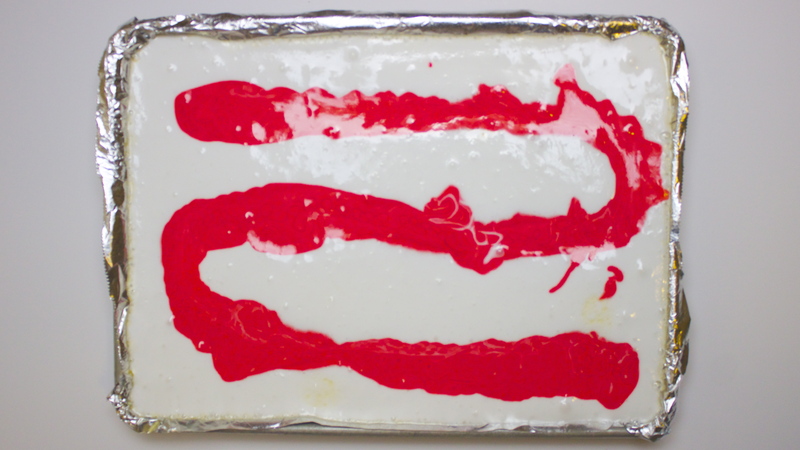 Using a butter knife, swirl the two colors together by gently guiding the knife in “S” shape movements. 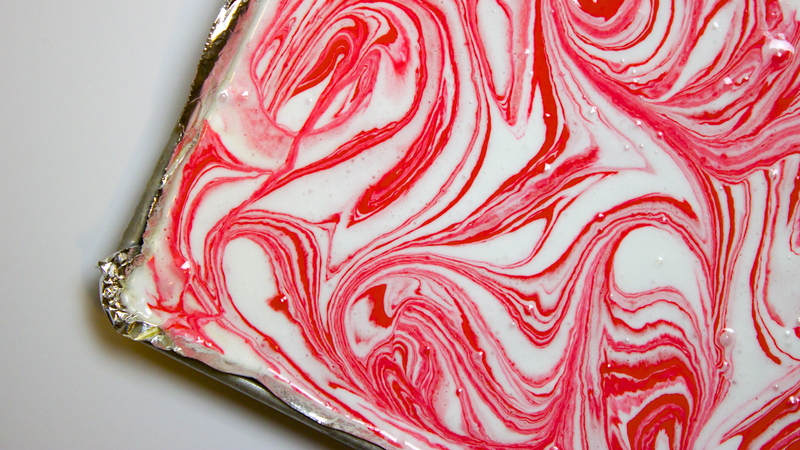 Continue moving the knife through until you’re happy with the amount of marbling. Make a point of “scooping” from the bottom a few times to ensure some of the red will be visible on the bottom when you remove the set marshmallow from the pan. Let the marshmallow sit uncovered until completely set, about 6 hours. 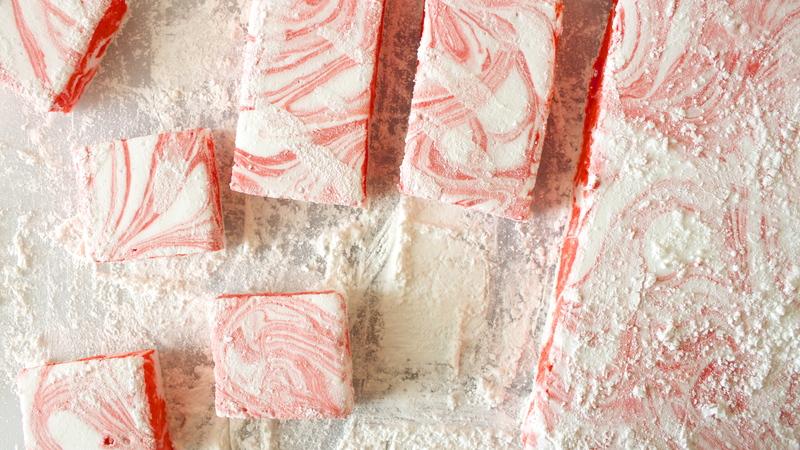 Cut marshmallows in whatever shapes you’d like. 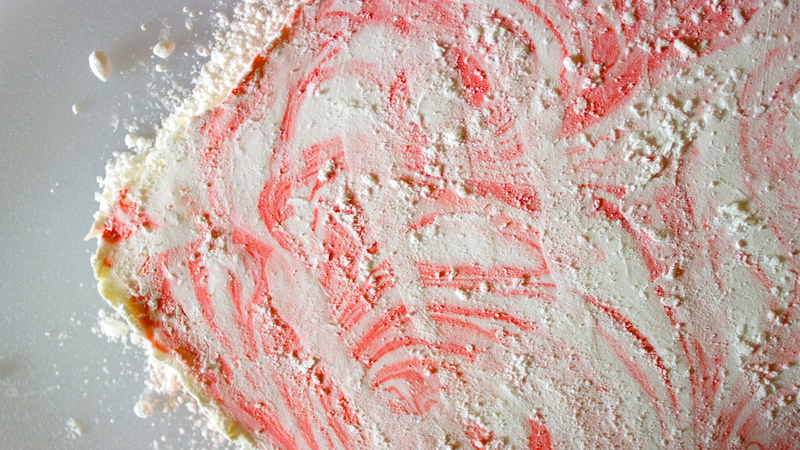 It helps to continually coat the knife or cookie cutters with powdered sugar to keep them from sticking. A pizza wheel is great if you’re just cutting into squares or rectangles. Dust pieces with powdered sugar. …but, if you’d like to make these chocolate-covered versions, definitely cut them in 2 x 2-inch squares.